Oil prices are expected to oscillate close to current levels well into the next decade, averaging around $65-70 per barrel through 2023, according to an annual survey of energy professionals conducted by Reuters. Despite the recent slump in oil prices, forecasts have edged down by less than $5 per barrel compared with the last annual survey conducted at the start of 2018 and have changed little over the last three years. Long-term expectations for the average price of Brent crude remain anchored around $70 per barrel, close to the $72 average realized in 2018 (tmsnrt.rs/2HebsXA). The results are based on the responses from just over 1,000 energy market professionals to a poll conducted between Jan. 8 and Jan. 11. Brent prices in 2019 are expected to average $65 per barrel, unchanged from surveys in 2016, 2017 and 2018. In 2020, Brent is also expected to average $65 per barrel, revised down by $5 or less compared with prior surveys. Far fewer respondents now see any risk of prices spiking to $100 or more by the end of the decade as a surge in U.S. shale output has eased fears of supply shortages. The proportion of respondents expecting prices to average more than $90 in 2020 has fallen to just 3 percent this year, from 13 percent at the time of the 2016 survey. By 2023, prices are still expected to average $70, with most forecasts between $60 and $80, which suggests most energy professionals think there will be enough production developed at this level to meet consumption growth. It's value is only what price it can be sold for. Guessing by Reuters surveys of how many "Professions" is the key. 3 "Professionals" or maybe less? The market will dictate what at that time in several years will determine. I put no faith in any predictions, let alone even Goldman's guessing games. Easy recoverable oil will run out eventually, then prices will rise, but there is much of this world that hasn't been explored and as technology keeps getting better it may keep prices down for a number of years. Way too many variables too predict much further out than even 6 months. In other words, these "expectations" are coming from someone "in the business", whose "income is on the line." I do not trust the impartiality of such people. As far as i am concerned, their "expectations" sound more like a "wish list." And i, for one, hope that Santa Claus does not give them their wish. With that said, everything they are talking about is BRENT....! I find this strange, as WTI acts as a "drag anchor" on BRENT. There are many threads in which various good and bad factors about SHALE,, and about WTI are discussed. Having read most of them, my take is that WTI and SHALE are pretty much stable at this point in time. There are improvements in transportation coming online, along with other production technologies that are in review that will enhance this stability for a bit further into the future..
As a result, i do not believe there is an MARKET, or TECHNOLOGY bottleneck that would cause prices to rise..
OPEC is in disarray, and is having trouble implementing its current small oil cut, so that takes anything political from OPEC out of play. So that leaves only some "other political event" to somehow affect production, or the market, in such a way that prices are affected. The only "political event" that i can think of that would be sufficiently important enough, is WAR. So, in my opinion, unless there is a WAR involving quite a number of either "production" or "market" or "transportation" entities, i DO NOT see prices rising much higher than they are now for the foreseeable future. This is my opinion, but then what do i know...! ps: there is also the "financial" side of this story, but i do not see a coming scenario where financing would stumble, so i discount a financing as problem in the near future. So here we are, after all those times OPEC put the screws to us and reduced supply, in a position to be the ones holding the screwdriver now. So how hard would it be, after new infrastructure is in place in west Texas, to open up the taps and drive the cost of oil down so far that the Saudis can no longer make any money. That would put them back in the position of being camel herders again...lol. They have squandered so many billions of dollars over the decades really believing that the rest of the world couldn't live without their oil. I bet their eyes are wide open now, like a deer caught in the headlights, right? 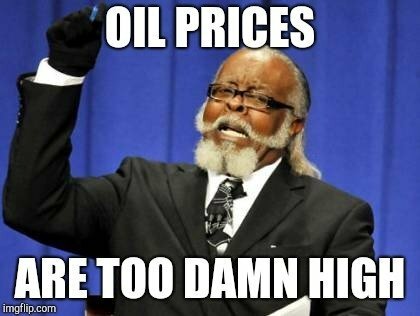 We know they need a minimum dollar amount to stay afloat and we could very easily keep oil under that number indefinitely, right? The ramifications are mind boggling, we are talking about the potential end of the Saudi royal family on the extreme side. What a load of tripe... "Experts" - Ex is a has-been, and spurt is a drip under pressure. Guess that makes me stubbornly optimistic. Which is weird, because half a year ago I was considered pessimistic when I kept saying that $80 oil is not sustainable, and lemming analysts kept hyping a return to triple digit oil prices. The price of oil is declining from a thousand tiny cuts. Cheaper solar panels here, electric buses there, natural gas fired ships somewhere else. Someone passes a law, someone else builds up a cheaper way to convert water and CO2 into fuel. And on and on. A lot of natural gas is needed to make ammonia for fertilizer. A lot of experimentation is going into ways of making ammonia without reforming natural gas. There's no shortage of ways that work, however none of them are the cheapest alternative. How long will that remain true? If some alternative appears, what happens to demand for natural gas? If effective price per BTU of gas drops, oil will eventually be affected, one way or another. As USA begins to pullback from world stage there will be less reliable suppliers in the world. Everyone depends on USA for security, transportation, secure shipping lanes. Middle eastern pipelines are nothing more than a dream since there is absolutely zero stability around Syria and even the borders of Turkey, Iraq and Iran. Middle Eastern suppliers and their customers will have to pay fees to USA for safe transport. Black market oil out of Iran is not sustainable and also requires USA security as China the biggest customer for these oil investments is unable to sail its flee outside of "China" sea. China is a paper tiger. Their weak military speaks for itself. They are unable to feed a standing army let alone sail across the pacific, even once. Finally, USA will be the largest, most reliable supplier of oil for next several decades until we move onto an alternative energy source; which we have also already found, tested, and yeah it works. For now, there is zero reason to change course; we are smarter, safer and more efficient than ever before at extracting this "black gold" from the earth, and we have so, so much supply. Oil will ultimately payoff all of USA debt; that; and our new Southern wall, which Mexico will pay for; as well as so many other deals coming our way. We did not invent finance although we are arguably the best at it. We will see USA net surplus again in our lifetime, golden age incoming. The entire world is finally on notice. Bend the knee or figure it out yourself. Good luck everyone! i would like to point out an important factor many of you seem to overlook, and that is the highly toxic nature of burning gasoline. Further, we seem to forget the impending extreme drop in american dollar, which i presume will happen at the end of this year. Also the significant growth from emerging economies, on the heels of the falling usd. economically speaking, in a healthy economy, toxic substances increase in value, not decrease. Aside from supply and demand, an important factor in human economies is economic penalties applied to substances that cause extreme biological harm. This process needs time for fruition. Under these parameters Oil is going to highly outpace any current pricing models, as many of these fail to consider the toxic element. Prices will significantly rise as a natural response to pollution and the ploy to reduce emissions. Although prices will rise, the current environment surrounding green energy, will force many large producers, and much capital, out of the oil industry regardless of rising prices. And of course environmental regulations are going to put significant pressure on oil companies, to either reform or depart. Here is my prediction for 2019 which has as much weight as what all the 'experts' say. basis WTI. 45 too low. Wait until early February to start buying WTI as hopefully by that time the US Gov't shut down will be over and the government will be spending money on all sorts of things. And also, hopefully the US/China trade dispute has made progress to being resolved. And a final kicker is the FED will be firmly in the pause camp of further rate hikes. They will still be selling 50 Bln every month. Why do you believe the US Dollar is going to crash by year end ? Karma implies that the dollar DESERVES to crash. I do not see such a situation. What you describe could be more descriptive of China and it's currency. China is an advanced sophisticated scientific economy. We are a god fearing over consumption based economy. Our biggest profits come from selling poisons enmasse to reckless consumers. Our wasteful and arrogant tendencies,even in our daily lives are representative of a much bigger problem. If we are to blame china for economic unbalance and presume this is treacherous enough to be holden of bad karma, i hardly think so. Our own personal overconsumption is the reason for this economic imbalance. Its because people like us buy so much useless sh%t. The ridiculous murder rate, the relentless overdosing(by the doctors and pharmacists and when guns, bombs oil and drugs are the back bone of your economic identity, then yu have big problems. Most peoples minds are skewed by the media, and thus we have very limited comprehension of just how powerful china really is. I recently read, that even Adam Smith commented on the richness of china, both culturally and monetarily. I can tell you right now, religion is banned from Chinese government, and therefore, generally speaking from SOEs. the connection might not be totally clear, when looking into belief systems and governmental and economic policies, but its a real thing. Given that obviously Church structures are realitivly successful business models, albeit, if it is mostly realestate and then i guess secondly Handouts. So this wont last. And then religion fails most at capital allocation. I think the economy is going to roar into the future, but there are many bumps and bruises that will be had. But you already knew that right ? i dont really know details, im more of a fundamentalist...haha a fundamentalist. I think china will have to sell more gold as there economy flatens. how much gold does china hold? i think china will sell gold short term.....im not privy to up to date stats on chinas gold transactions.